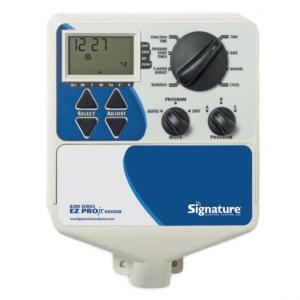 Signature’s EZ Pro™ Jr. 8200 series is available in 4, 6, and 9 zones. This indoor plastic cabinet AC controller with external transformer easily mounts in any location near a 120V electrical outlet. For easy programming, mounting at eye level is recommended. Unit offers three programs, multiple start times and scheduling options. This series controller is packed with several advanced water management features, such as global water budgeting, water budgeting by month, and event days scheduling. Signature Control Systems, Inc. acquired Nelson Turf in September of 2008.